In our family we enjoy a good Poke Cake with Cool Whip Topping once in awhile. 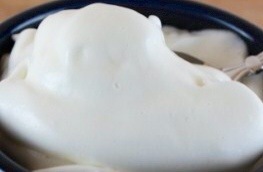 So I’ve been wanting to know how to make homemade cool whip. I found this great gluten free recipe. It’s wonderful. Mix all ingredients together and whip on medium for about 2 minutes. You need to use the wire whip to mix this. Then turn to medium high, this is about speed 6 or 8 and mix for another 6 minutes, or until it reaches desired consistency.